ONLY 5 DID IT WITH BOTH VIJAY AND AJITH! 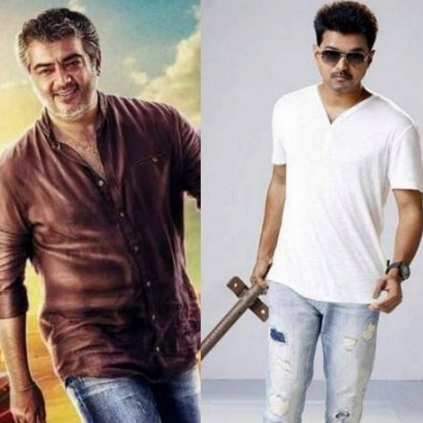 Two undeniably big stars that the Tamil film industry possesses are Ajith and Vijay. Both the artists started their careers around the same timeframe and went on to earn large fanfare over a period of time. With more than 50 odd films done by both stars, very few directors have actually managed to earn successes with both of them. Among the list, it is only Vikraman, SJ Suryah, Vasanth, AR Murugadoss and Ezhil who’ve given Hit films with both Thala and Thalapathy. The above directors had the capacity and vision to accommodate both these diverse actors in their scripts and taste victory. Vikraman prioritized the story and had Vijay and Ajith playing pivotal roles in them, but S.J.Suryah gave a whole new different edge to these contemporaries. Vasanth, on the contrary, dwelled on the emotions of the story more than anything else. But when Ajith and Vijay were fully established as frontline heroes, AR Murugadoss capitalized on their star-power and made blockbuster films. Congrats to these directors who are part of this elite list. Have we missed any? Will Shruti Haasan match Premam's Malar ? Kamal Haasan’s assistant gets a big break! Doctors Have Advised Ajith To Take 6 Months Of Complete Bed Rest. Stunt Silva Explains How Ajith Fainted While Shooting For A Stunt Scene. Vijay's Theri Opening Song Lyrics Are Here! People looking for online information on Ajith, AR Murugadoss, Ezhil, Sj suryah, Vasanth, Vijay, Vikraman will find this news story useful.